In light of Russia’s interference in the 2016 presidential election, President Trump has taken no shortage of flack for his relationship with Vladimir Putin. Now, as the world watches both leaders at their summit in Helsinki, the Russian and U.S. presidents are only exacerbating claims of collusion: Upon meeting, Trump and Putin immediately launched into a five-minute-long handshake and chant that made it fairly obvious they attended the same fat camp last year. Folks, if there’s a smoking gun connecting Russia and the Trump campaign, this is it. 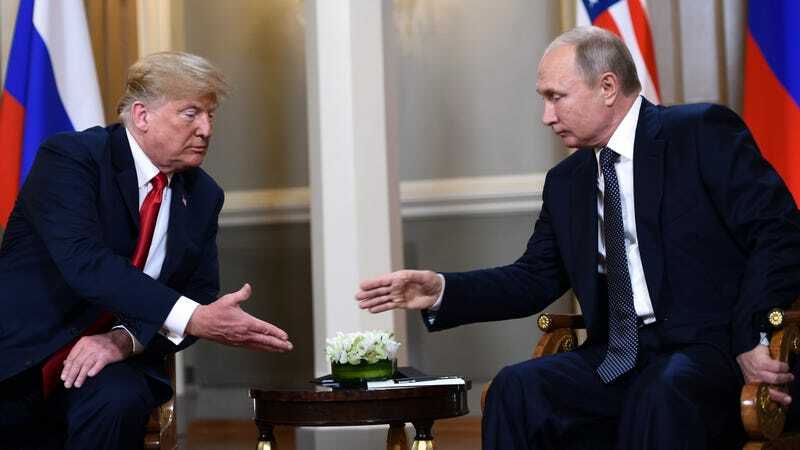 The world watched on in shock this morning as Putin and Trump warmly approached each other at the top of the summit meeting and immediately entered into a spirited secret handshake and chant that all but confirmed that last year both leaders were assigned to the same cabin at Camp Healthy Start, a summer-long weight-loss program in the Berkshires that encourages healthy lifestyle habits through positivity and fun. There’s no way to sugarcoat it: This is pretty damning. Though Trump has aggressively claimed that the investigations into his collusion with the Russian government is nothing but a baseless witch hunt, he appears to have shown the world incontrovertible evidence that he and Putin communicated with each other extensively for the entirety of Camp Healthy Start’s eight-week session last summer. The long handshake and cheer finally came to an end five minutes later as Trump and Putin proudly showed press cameras the blue ribbons they were given on the last day of camp to celebrate hitting their weight-loss goals, with Putin’s ribbon stating an impressive loss of 30 pounds and Trump’s ribbon announcing a respectable loss of 15 pounds. Wow. You can expect Robert Mueller to subpoena every counselor at Camp Healthy Start any day now. It’ll be pretty difficult for the Trump administration to talk their way out of this one. President Trump will likely continue to deny colluding with Russia to tip the 2016 election in his favor. However, to anyone who’s paying attention to the close bond he formed with Putin as they learned to love and take better care of their bodies at fat camp, it’s all but confirmed.